Mattie was born in the 1930 or 40's. She is a composite doll with wonderfully hand-painted face. Her pink satin and net dress is original and was refitted for her. The apron was a hand-tatted doily. It is embellished with a variety of satin roses, peonies, and dianthus, with small lace daisies. Iridescent 'dewdop' beads shimmer at the waist and hem. 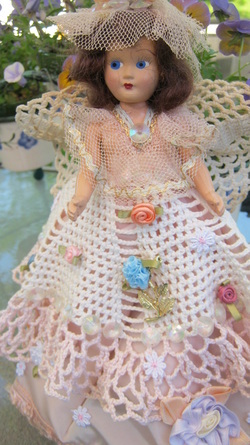 Her 'wings' were created from a 1940's doily. The 'halo' utilized her original net scarf and was embellished by more 'dewdrops' and a satin peony. Center front on her apron Mattie holds a pin, which is able to be removed and worn. I created it by combining a vintage gold-tone metal flower stem and a satin blue dianthus. If you'd like Mattie makes a very useful and pretty pin holder, you can attach floral pins to her apron, be they vintage from your collection or new, she makes a great display piece. 'Waltz of the Flowers'. As she spins to the tune her dewdrops shimmer...and the more floral pins you add....the more flowers twirl with her. Mattie stands 10" high and her skirts billow out 8". A copy of Mattie's story comes with her when shipped. 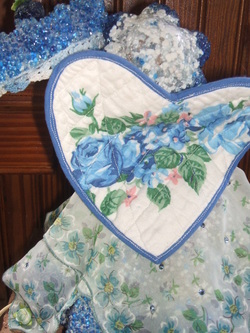 a floral cotton heart shaped quilted coaster. 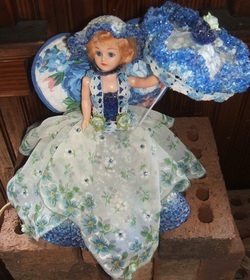 This Angel makes any blue day brighter since she has a wooden candle lamp beneath her skirts. This is Angel. She is a musical prayer box. Angel is a porcelain doll from the 80's. She wears her original tulle apron and lame' wings. I added a vintage hankie that I hand-embroidered and embellished with blue paper roses. Her halo is a vintage rhinestone pin of blue 'sapphires' and 'diamonds'. She sits atop a cream painted wooden box that is filled with a vintage cream doily and a 1960's Virgin Mary charm. the base of the box is positions on a musical movement that plays, 'Amazing Grace'. This angelic music box would make a great gift for a baptism, for a child or adult, a First Communion, Confirmation, or a Birthday. 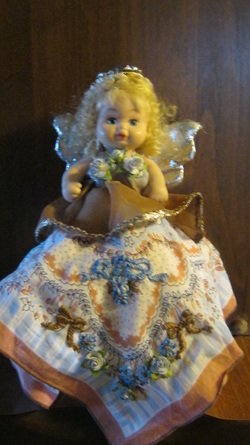 Angel stands 10" high and is 6" wide.